The battle never ends... The fake public safety study... How many people have been injured by a street performance? The real public safety issue is abuse of alcohol and drugs.... The City's own Police Reports will document this... Will the Honolulu City Council ban alcohol sales from 7-10 PM? No! The issue is not about public safety. It is about class and money. "City Hall of Shame" continues -- Stephen Baird. Computer simulation program used to ban performances in Waikiki from 7-10 PM. http://www.simwalk.com/applications/simwalk_urban_planning.html The simulation study, conducted by Karl Kim, Professor of Urban and Regional Planning University of Hawaii at Manoa, is based on pedestrian counting data for the Kalakaua Avenue. This study ignores the research of actual photographs and films by urban planner William H, Whyte that show people will "self regulate" crowds to minimize danger to personal safety. This research concept was confirmed when the Honolulu Police Chief stated there have been no injuries caused by street performances at a public hearing. See: Urban Studies Statement by Dr. Allan Schnaiberg, Professor of Sociology and Urban Affairs at Northwestern University "Finally, I want to speak briefly to the matter of street performances and congestion of city streets. Following the profound insights of planners such as Jane Jacobs, reinforced by recent pedestrian-observation studies of my fellow sociologist William Whyte, I want to suggest that our major urban problems in North America stem from too little pedestrian congestion and too much vehicular congestion. Urbanites (and even many suburbanites) find comfort and attraction in pedestrian congestion. That is why a sole street observer looking up soon collects a crowd, regardless of what he or she is looking at! Seriously, street activity is an inherently social activity: too little street congestion, it has been shown, actually decreases the propensity of many urban and suburban dwellers to shop or walk certain streets. And this is true quite independently of the risks of street crime, A heighted street density introduced by street performances actually reduces fear of crime, and increases numbers of pedestrians (thus often enhancing commercial activity in the areas near street performances). And this is true of local residents as well as tourists. Thus the increase in street performances will enhance the attractiveness of Chicago street to residents, suburbanites, and tourists alike - thereby increasing local profits and tax revenues and making Chicago a more livable place still." See: http://www.streetvendor.org/ The Street Vendor Project has launched a campaign to identify who is encroaching on our public spaces, and where. Invariably, the same big business and Business Improvement Districts who complain about vendors blocking the sidewalk are themselves illegally taking up our public spaces. For example: Lately, concrete planters have been blossoming on our sidewalks like spring crocuses. The Department of Transportation requires that all planters have permits, but 90% of the sidewalk planters in New York are completely illegal. The city does nothing. When vendors block the sidewalk, they are arrested and put in jail. When big businesses do, the city looks the other way. We should all take a critical look at who is really occupying our public space. Each vendor's table or cart is, at most, four feet wide by ten feet long. In contrast, big corporations routinely block the sidewalk with hundreds of phone booths, trash containers, news boxes, and planters, in ways that are much more intrusive than vendors could ever be. Waikiki Documentary ADHD Films, LLC is doing a documentary on the new law that bans street performers in certain locations and during certain hours in Waikiki. If you are looking to be a part of a fun documentary experience then email info@adhdfilms.com http://www.adhdfilms.com ADHD Films, LLC, 345 Queen Street, Suite 900, Honolulu, HI 96813.
http://starbulletin.com/2006/01/08/editorial/commentary3.html January 8, 2006, Star Bulletin: Don't let private interests kill Waikiki street life by Jon Mitchell, who performs as the "Copper Cowboy," is a resident of Waikiki and a member of ROAAR (Residents of Oahu and Artists Against Restrictions). 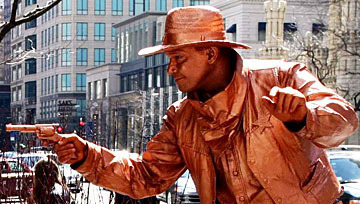 Jon Mitchell aka "Copper Cowboy"
http://www.fodors.com/forums/threadselect.jsp?fid=1&tid=34719593 Street Performers in Waikiki by Jon Mitchell, who performs as the "Copper Cowboy," is a resident of Waikiki and a member of ROAAR (Residents of Oahu and Artists Against Restrictions). http://www.msnbc.msn.com/id/10551815/ KITV-TV&emdash;Honolulu, HI -- Street performers would not be allowed along Kalakaua Avenue in front of the International Marketplace between 7and 10 p.m., under the bill that passed the City Council, by a 7-2 vote. http://khon.com/khon/display.cfm?storyID=9875&sid=1153 KHON 2 News - City Council wants street performers gone by Linda Coble -- They are among the tourist attractions in Waikiki -- street performers. But the Honolulu City Council wants them gone. I have been hearing many concerned voices regarding the banning of street performers in Waikiki also called bill 71. If you want to speak up and be heard by city council you can submit written testimony to jtada@honolulu.gov or call before Dec 7th or morning of . You can also submit oral testimony on Dec 7th at 3pm I have a link below to register for that. Please Pass This Information On !!! I hope this was helpful for those who want to speak up against this bill but don't have time to figure out the crazy system . HONOLULU -- In a victory for free speech advocates and champions of artistic expression, a district court judge today threw out a local ordinance that unconstitutionally limited the rights of street performers in the city of Waikiki on Oahu. The legal challenge was originally brought by the American Civil Liberties Union of Hawai'i on behalf of clients who included a musician, a magician and a youth leader from an area church. Defenders of the ordinance - which restricts performers' access to parts of the city and stipulates a lengthy permit process -- claimed their original intent was to ensure the safety of persons performing around constant pedestrian and vehicular traffic. "The decision acknowledges that the city's claim of concern for safety was false. The evidence showed that they wanted the street performers not in locations that were safe but in locations where they would not be able to reach an audience," said Brent White, Legal Director of the ACLU of Hawaii. In her 42-page opinion, Judge Virginia Crandall said the city ordinance violated the First and Fourteenth Amendments to the federal constitution and corresponding provisions of the state constitutions; her ruling permanently blocked the law from taking effect. The ordinance had been scheduled to go into effect on July 12, 2000, but had been temporarily prohibited after the ACLU filed a legal challenge in June of that year. The measure sought to ban religious, political, and artistic expression in almost all of Waikiki for all individuals, not just street performers, the ACLU argued. For example, the ordinance banned such acts as reciting the bible on the street corner, singing patriotic songs, chanting slogans against the government, and sitting on a public bench strumming the guitar. Individuals who wished to engage in free expression had to apply a month in advance for a permit for one of six remote locations. The ACLU's clients included musician Steve Sunn, known as "Sonny Beethoven," who has been playing the saxophone in Waikiki for almost 20 years; Steve Williams, a street magician; and Shawn Kawelo, who leads the Greater Mount Zion Holiness Church youth group to Waikiki every other Friday where they sing, recite the Bible, and preach as a means of spreading their religious message. "Today's decision vindicates our arguments that the city all along had no intention of protecting the rights of street performers but instead intended to eliminate them from Waikiki," said Earle Partington, co-counsel in the case. Support for the ordinance came largely from the Waikiki business community. The City Council did not invite testimony from a single street performer. Bainum and others who should know better have let themselves be taken captive by the tourist industry, and have combined to form a First Amendment "City Hall of Shame." To qualify for this pantheon, one must understand it is wrongheaded and dangerous to use the O'Brien standards as window dressing for unconstitutional limitations on free expression -- but be willing to do so anyway. This criterion eliminates some likely candidates. Councilmember John DeSoto, for example, apparently has zero understanding of the issues, and once asked of the entire Council, "What's wrong with banning street performers all together? I say ban it." Qualifying for the City Hall of Shame, besides Mayor Harris, are five who do understand that Honolulu should not be governed after the fashion of Disneyland, but who are, nevertheless, intent on doing so. City Hall of Shame Honolulu Hale ignores First Amendment Freedoms. by Robert M. Rees published on August 8, 2001 by Honolulu Weekly.